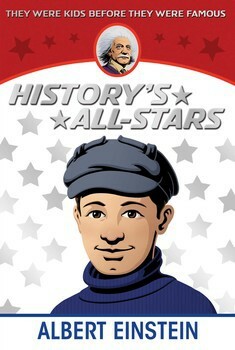 Part of the Childhood of Famous Americans fictionalized biography series. Before Albert Einstein was an internationally renowned genius, he was a kid—learn all about his childhood and what makes him an all-star in American history! Albert Einstein is a household name synonymous with genius around the world. His work unlocked mysteries of the universe and also impacted everyday conveniences like remote controls and televisions. And while most are familiar with Einstein’s adult wisdom (and wild hair), do you know what he was like as a child? From his passion for music—he played both the violin and the piano—to his early curiosity for understanding the mysteries of science, in this narrative biography you’ll learn all about Albert Einstein’s childhood and the influences that shaped the life of a remarkable man. ages 8-12. 208 pages.